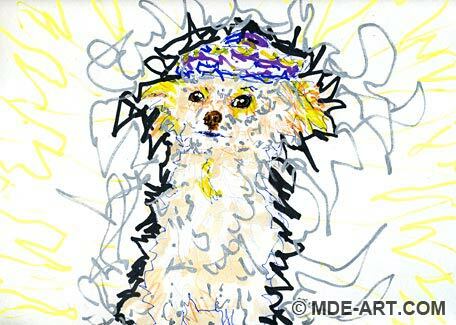 These are two 9″x12″ paintings / drawings of dogs with sombreros. 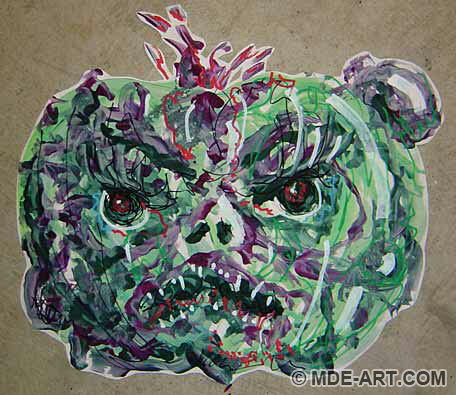 The first dog is a papillion poodle mix, drawn and painted on paper with pens, markers, colored pencils, silver paint pen, and watercolors. 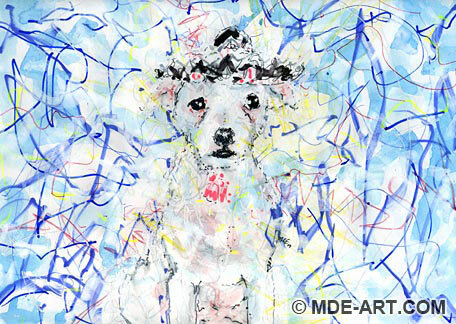 The second dog is a jack russell terrier, also drawn and painted on paper with pens, markers, colored pencils, silver paint pen, and watercolors. I don’t think dogs are comfortable wearing sombreros, hence the disconcerted look on their faces. These are 2 drawings of lion cubs. The first lion cub was drawn with markers, oil pastels, and paint pens. The line work in the first drawing started out fairly loose, but tightened up as I tried to correct proportion, value, and position mistakes. 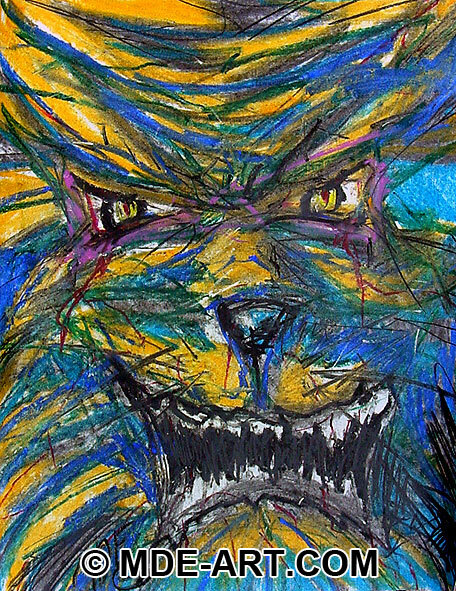 I left the second lion cub drawing abstract and cartoonish, and also used markers, oil pastels, and paint pens. 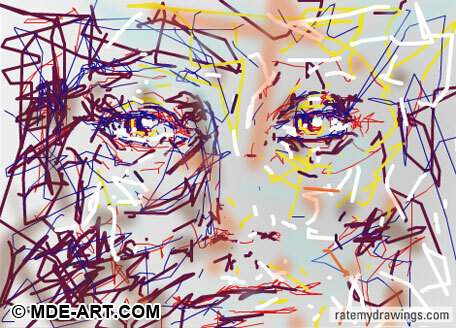 The drawings are 9″ x 12″. Halloween is an interesting tradition. Fun and morbidity all rolled into one celebration! I recently painted some quick decorations for a birthday party, consisting of imaginative vegetable and fruit characters and vibrant fish. 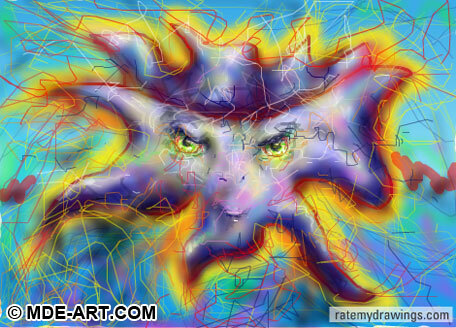 They were received very well for their loose, cartoonish and stylized nature. So when some close friends said they would be throwing a Halloween costume party and needed some decorations, I knew I could help. I decided to pick up some cheap paints, a butcher block of paper, and spent an hour painting some fun and scary Halloween decorations. The guidelines for the Halloween party decorations were to stick with a blue and green theme with spatters of red. 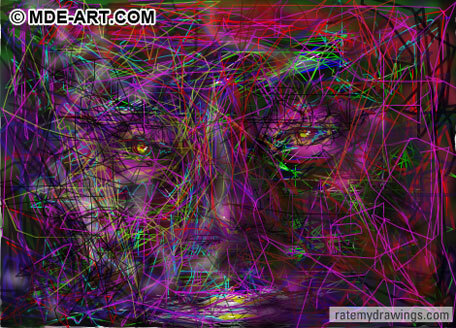 I was also given permission to push the paintings a little further into the horrific realm. 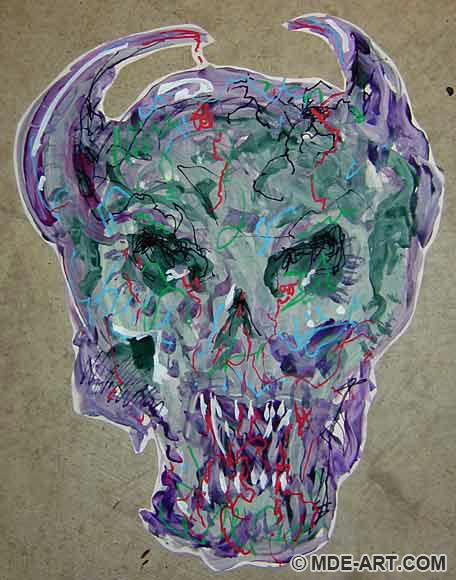 Presented below are the scary Halloween paintings and decorations. 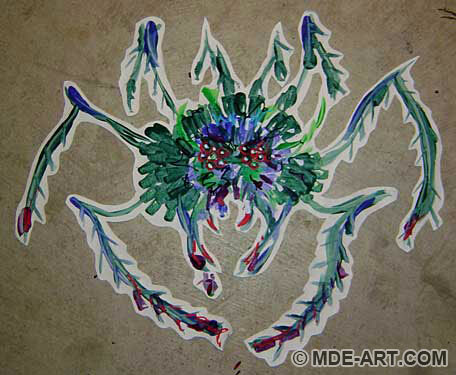 Each is roughly 18″x24″, and can be easily taped to a wall or ceiling, or wherever you want to decorate for a party. They consist of, in order, a Pumpkin, Severed Head, Demon Dog, Demon Skull, Spider, Demon Bat, Severed Hand, and Snake. For more scary drawings visit Macabre Series 1 – Blood, Skulls, and Paranoia or the Monster in My Closet. 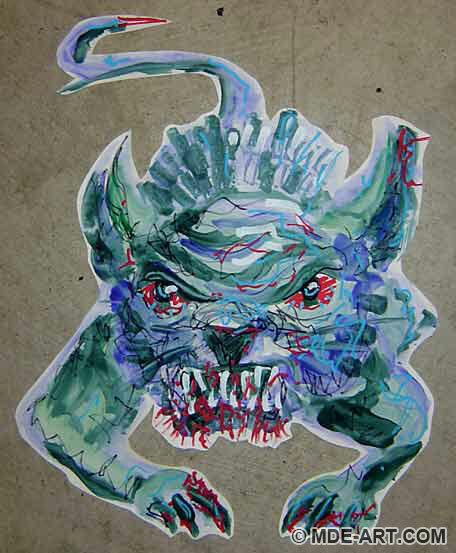 This is a drawing / painting of a Chihuahua, created in 2008 with Pen, Ink, Markers, Paint Pens, and Watercolor mediums. 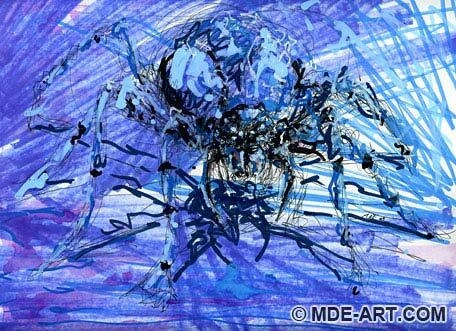 The artwork is approximately 9″x12″, and expresses the energy and vibrancy of the Chihuahua dog breed through frantic line work and bold colors in a slightly abstract impressionistic style. The pervasive white background breathes consistency through the entire drawing / painting and helps to maintain a sense of fragility and lightness. Meanwhile the pup’s darkly colored eyes reflect the strength and determination of this unique animal. This artwork is both a drawing and a painting of a Leopard that is approximately 9″x7″. 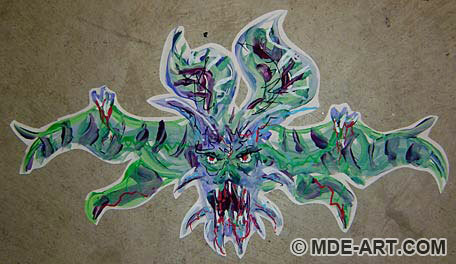 Mediums used are brightly colored pencils, pens, markers, watercolor, and a silver paint pen. 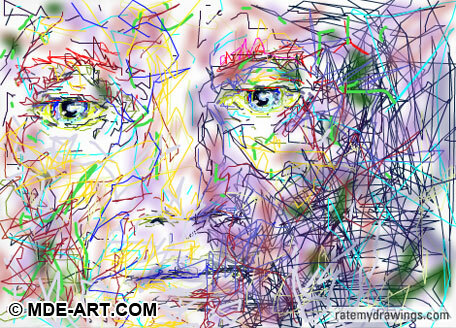 A few light sketch marks were initially drawn in for reference, and then varying combinations of mixed media were applied in layers. Eventually the shape of the leopard started to solidify amidst the energetic lines, and the silver paint added a reflective quality that is not apparent in the digital reproduction of the drawing/painting. 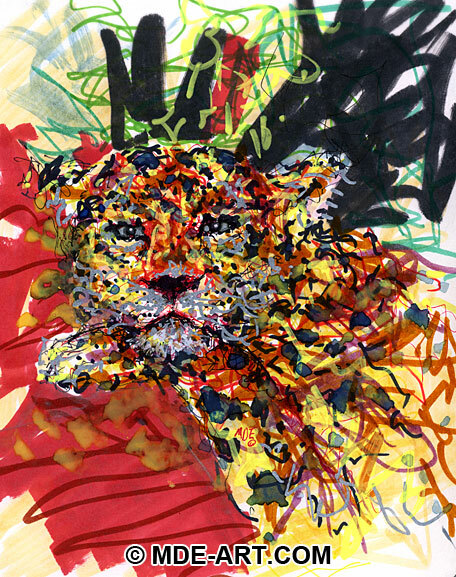 Similarly to the way a leopard can blend in to the jungle environment, the animal’s form is not immediately recognizable in the artwork as it blends in with the chaotic colors and busy line work. More animal drawings and paintings can be found in the Animal Portrait Art Gallery. These two artworks depicting lions blur the line between drawings and paintings. 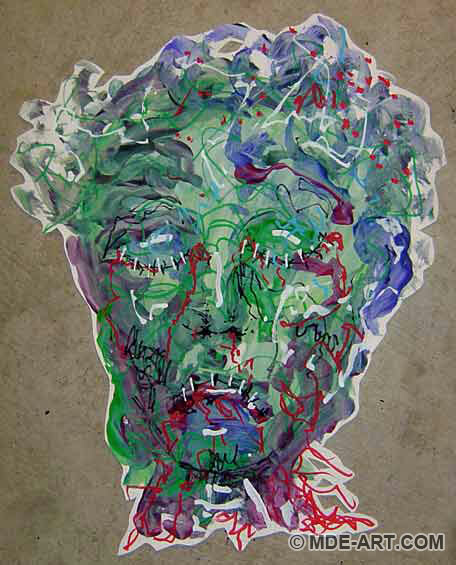 Each artwork started as a drawing of a lion, which was then augmented with watercolors, ink, or paint pens. The first lion drawing was sketched with a pen and thick black markers. A wash of watercolor and ink was used to add shadows and blend the crisp lines, resulting in a statuesque portrait of the lion. 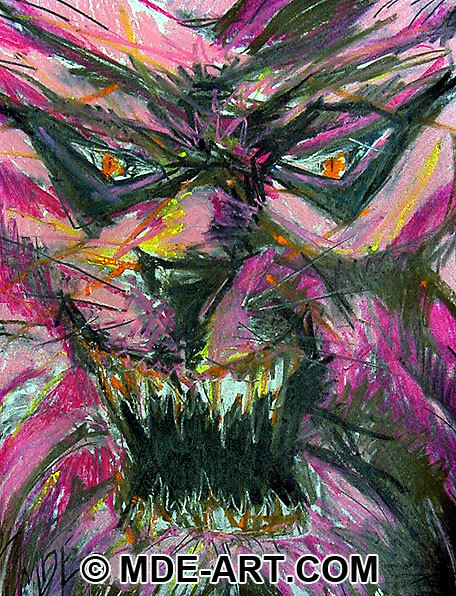 The second lion drawing was initially sketched with pen in an impressionistic style, and layers of paint pens were subsequently added over the initial sketch. 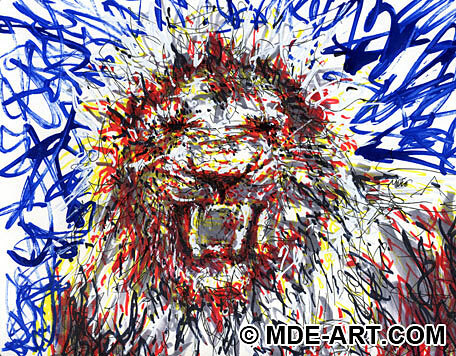 The resulting painting of a roaring lion fits the energetic style, and the discord between the primary colors add tension between the lion and the background. 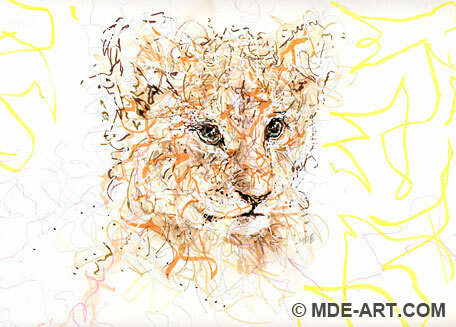 Just a few samples of other unique stylistic approaches to lion drawings and paintings include these lion drawings, a portrait of a lion drawn with charcoal, an abstract lion painted with markers and paint pens, close up charcoal drawings of roaring lions, and a digitally drawn cartoon lion. 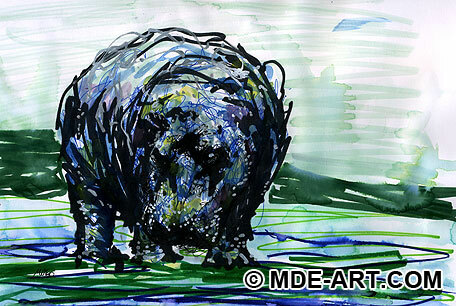 This is an expressionistic painting of a walrus, using acrylic paint. 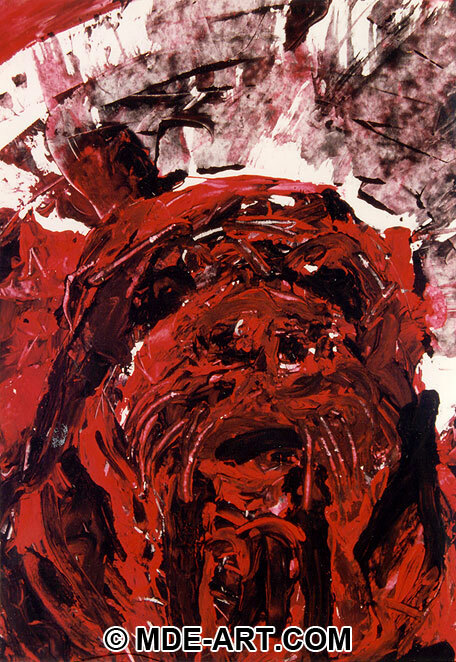 Thick layers of black and red paint were pushed and smeared around the paper to create the abstract and expressionistic shapes and textures of the walrus. The paint was scraped off and rubbed on, and parts of the paper are untouched by paint to enhance the glowing white background. 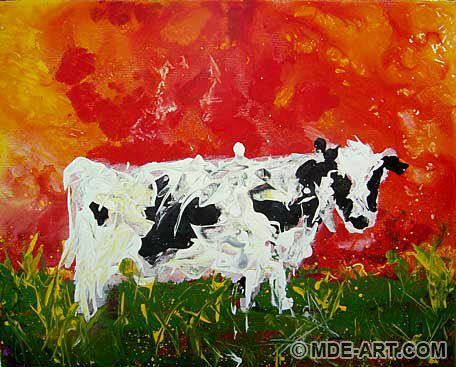 This acrylic painting was created in the year 1998. 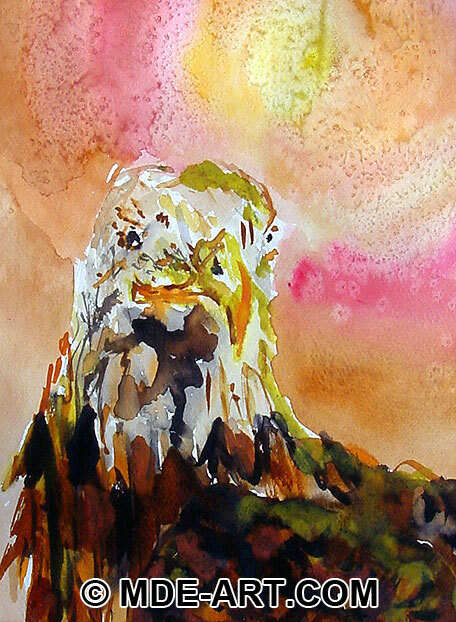 This bald eagle watercolor drawing / painting was created in 1998 with a mix of watercolors and salt. The eagle was drawn in first with some light pencil marks. Then various washes of brown and yellow colors were dabbed in to create feathers, eyes, and the beak. For the sunlit background, a wash of water was first applied to the canvas. Color was then added to the page in concentric circles around a large puddle of yellow, and the water blurred and blended the colors together. While the paint was still wet, salt was thrown on the background, which gives the painting texture and a unique crystallized look. This helps to separate the background from the painting of the eagle. 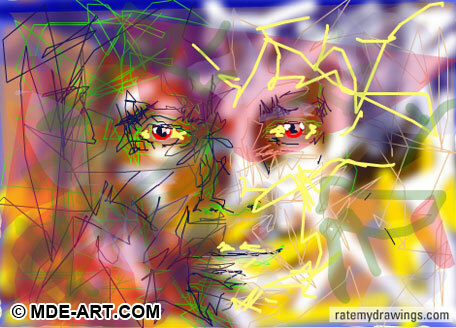 These two Lion Drawings were created at two different times, in 2 different mediums. 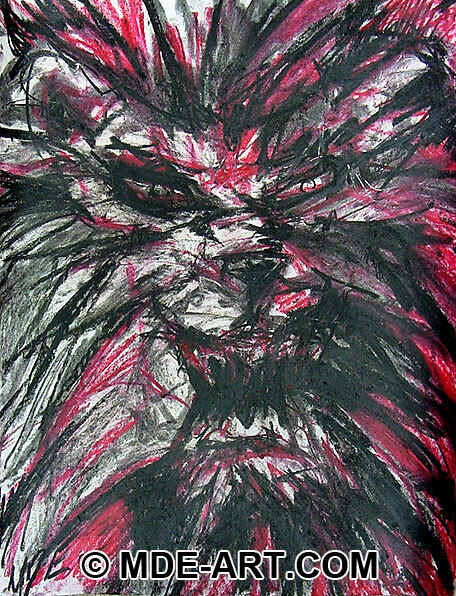 The first lion art was drawn in charcoal in about 1997. 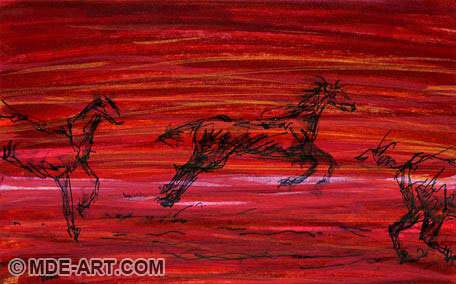 Heavy black charcoal, and rich red and sienna colors were used in a limited palette. Some of the white highlights are just the white of the paper, while white chalk was used extensively in other areas of the drawing. The heavy lines and deep black shapes help to enhance the power and fierceness in the lion’s pose. 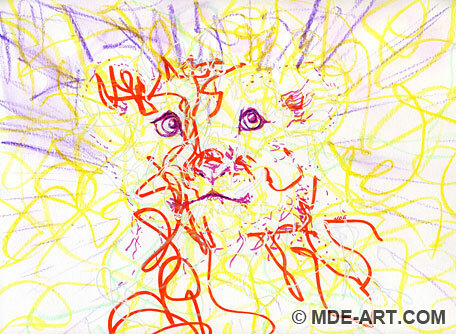 The second lion drawing was made with Pens and Markers in 2003. A quick pen sketch was drawn, and then a black silhouette was filled in around the profile of the lion’s face. 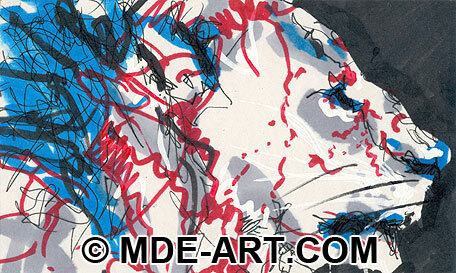 Gray markers and splashes of red and blue color were used to add an offbeat contrast of colors not normally seen in a lion, which gives the drawing an abstract surreal feel. White paint was also used for highlights. 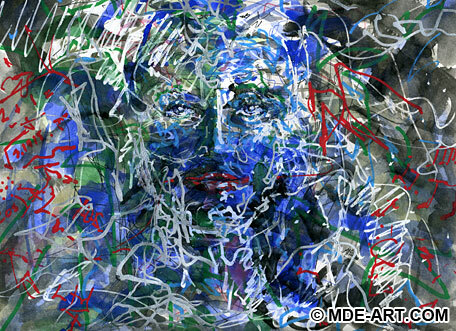 On each layer of the drawing, the pen and marker lines always reflect an uneasy intensity in the art. 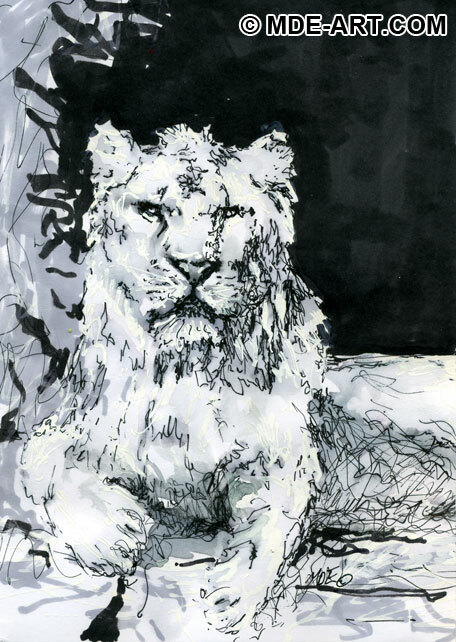 To see more lions in a variety of artistic styles, view the Animal Drawings and Paintings art gallery, pen drawings and paint pen paintings of lions, or expressive charcoal drawings of lions in the Art Blog. 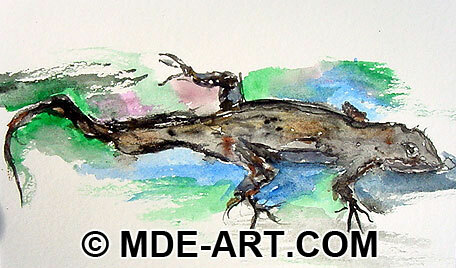 This is a watercolor painting of a lizard, also known as an “Anole”. The little lizard was sitting on the patio in 1997, so I grabbed some watercolors and quickly painted in some basic shapes. Sometimes they act like Chameleons, because their skin changes color to reflect the colors in their environment. This one took on the grays and browns from the cement, however I took some artistic liberty in adding a few abstract splashes of color to represent the leaves and water around the lizard. This also helps set the lizard apart from the background. White highlights in the painting, around the lizards face, were created by leaving sections of the white paper untouched by the watercolor. 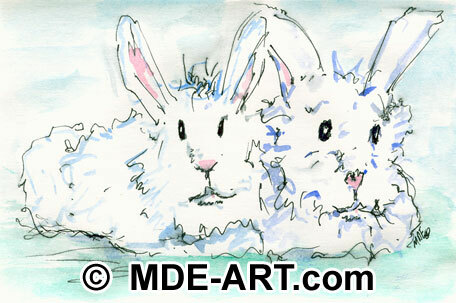 This watercolor painting of two bunnies was painted in 2003. The bunnies were initially sketched in pen, and then shades of watercolor paint were added later. 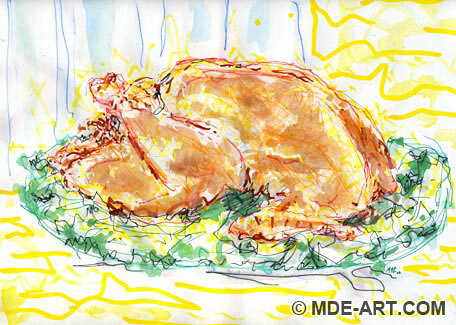 The pen sketch was very loose, and each bunny was painted with minimal, muted color. This helps to reinforce the fragility and timid nature of the bunnies, and creates a sense that they need each other to stay strong and warm in their world. Their expressions also give insight to their character. 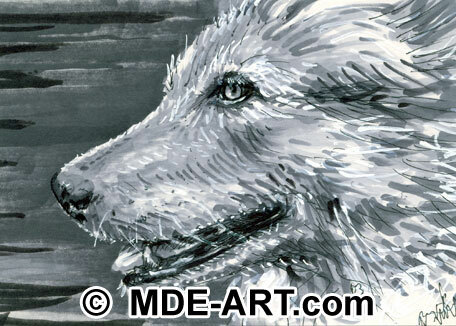 This artwork is a Pen, Ink, and Marker drawing of an Alaskan Husky dog. 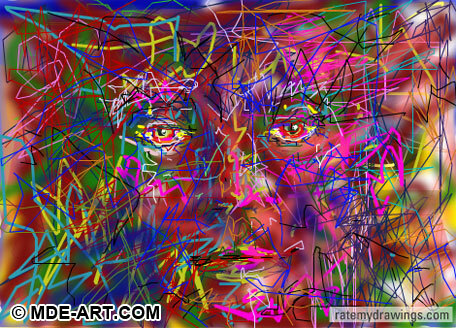 It was drawn in 2004, with varying shades of grey markers. 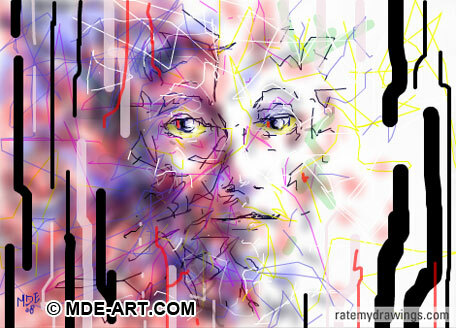 Midtones were sketched in to define the shape and form. Dark colored markers were used to fill in the shadows. 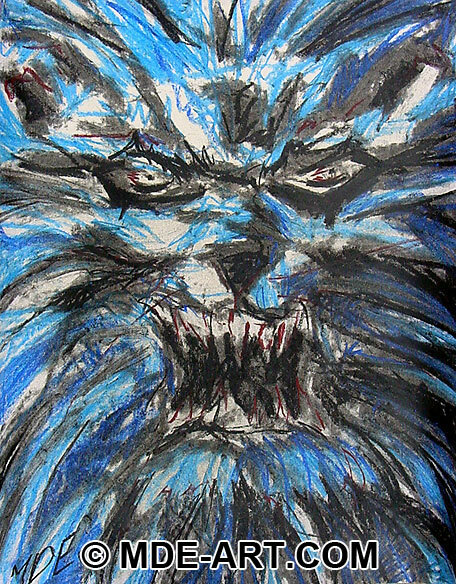 And the white of the paper or white paint was used to add highlights and furry hair. The drawing is only 4″ x 6″ and was commissioned for the owner of the dog, which was their favorite Alaskan Husky.